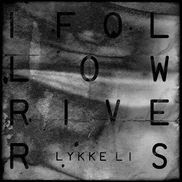 New Lykke Li's album "Wounded Rhymes" will be released this March, artwork and tracklist are already revealed and today we can already listen second single "I Follow Rivers". Comparing with previous "Get Some" single "I Follow Rivers" is more calm but midtempo track with retro-baseline in a Winehouse-style on one hand and with Lykke Li's vocal making whole thing very unique, recognizable for Lykke and not like anything else you use to listen from other artists. You can also catch on youtube performance of 5 other songs from album performed by Lyke live, mostly quite dark and melancholic but very special stuff.